I am going to be spreading the Social Networking love with a small series of vinylmation giveaways! The first ends today! Tinkerbell Vinylmation Instagram Giveaway! 3- Keep your eye on our IG account for the winner announcement on Friday! If you are the winner, email me at: PicturingDisney@gmail.com with your name and address! 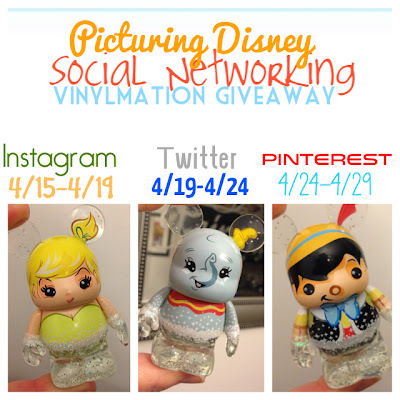 Starting today is the Dumbo Vinylmation Twitter Giveaway! 2- Retweet the Dumbo vinyl picture from this morning with the tag #PicturingDisneyGiveaway and mentioning me @PicturingDisney! 3- Keep your eye out for the winner announcement on Twitter on Wednesday! And next week you will have the chance to repin on Pinterest to enter to win the Repin Pinnochio Vinylmation Giveaway! 2-Look out for the Pinnochio Pin on Wednesday! 4-Keep your eyes on the blog for the announced winner! Win Vintage Orange Bird Collectible Toys!! !